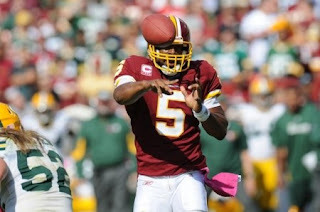 The Washington Redskins were off to a 2-2 start as they hosted the Green Bay Packers at FedEx Field on October 10, 2010. The team had undergone a transformation following a miserable 4-12 record in ’09, bringing in GM Bruce Allen, Head Coach Mike Shanahan, and a new veteran quarterback in 33-year-old ex-Eagle Donovan McNabb (pictured above). Green Bay, under Head Coach Mike McCarthy, was 3-1 and following up on an 11-5 record in 2009 that had put them in the playoffs. A young team, the Packers were retooling well, particularly at quarterback where Aaron Rodgers was proving to be a worthy successor to long-time star Brett Favre. The Packers had possession first, but following a short kickoff return they turned the ball over on the second play from scrimmage. Rodgers passed to TE Donald Lee for 17 yards, but the tight end fumbled and safety Kareem Moore recovered and advanced 13 yards to the Green Bay 21. However, the Redskins moved backward rather than forward and ultimately were forced to punt from their 44. Starting at their own 10, the Packers made a big play immediately as RB Brandon Jackson ran for a 71-yard gain to the Washington 19. Five plays later Rodgers threw to Lee for a five-yard touchdown and the early lead. The teams traded punts for the remainder of the opening period, although a 35-yard pass from Rodgers to WR James Jones had the ball in Washington territory to start the second quarter. But after reaching the one yard line, the defense stopped two running plays and a Rodgers pass into the end zone was broken up on fourth down. The Redskins advanced to their own 33 before being forced to punt and Hunter Smith’s kick was returned 52 yards by CB Tramon Williams right back to the line of scrimmage. Mason Crosby kicked a 52-yard field goal four plays later to make it 10-0. After another exchange of punts, the Redskins appeared to be trapped back in their own territory before McNabb completed a pass to WR Santana Moss for 52 yards on third-and-18. Two carries by RB Ryan Torain gave the Redskins another first down at the Green Bay 25 and a McNabb shuttle pass to Moss gained nine more yards to the 16. A throw to TE Chris Cooley moved the ball inside the 10 and, with the clock down to 13 seconds, Graham Gano kicked a 26-yard field goal to conclude the 12-play, 78-yard drive and make the score 10-3 at halftime. The Packers put together a 70-yard series in 9 plays in their first possession of the third quarter that featured a Rodgers pass to WR Donald Driver for 34 yards. Crosby was successful with a 36-yard field goal that put Green Bay back in front by ten points. Following a short Washington possession, the Packers moved to the Redskins’ 29 in eight plays but Crosby missed a 48-yard field goal. The score remained 13-3 heading into the fourth quarter. 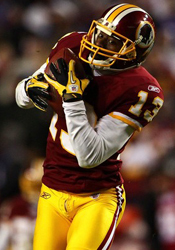 The teams again exchanged punts until the Redskins, who had largely been dominated by Green Bay’s defense, struck quickly as McNabb went deep down the middle to WR Anthony Armstrong for a 48-yard touchdown. With the successful extra point, Washington was just three points down with plenty of time on the clock. After the Packers punted on their next series, McNabb went to Armstrong (pictured at right) on the first play for a 23-yard gain. When the drive stalled at the Green Bay 47, it was McNabb to Armstrong again for 13 yards and a first down on a third-and-10 play. But the Redskins could gain nothing further and Gano’s field goal attempt from 51 yards was wide to the right. Green Bay failed to move the ball and punted back to the Redskins with just under four minutes remaining in regulation. With McNabb completing three passes, including 30 yards to Cooley, Washington went 53 yards in seven plays and this time Gano connected on a 45-yard field goal to make it a tie game at 13-13. The Packers took over at their 21 with 1:07 on the clock and in three plays made it to the Washington 35, but Crosby’s 53-yard attempt at a game-winning field goal hit the upright and bounced away. There was time for one more play from the Washington 43 and a long pass by McNabb was intercepted by Tramon Williams at the goal line and returned 64 yards. The game went into overtime. Characteristic of much of the game, the teams traded punts to start the extra period and then Rodgers was intercepted by diving safety LaRon Landry to give Washington the ball at the Green Bay 39. The Redskins advanced to the 15 with the help of two defensive penalties and Gano finished the contest with a 33-yard field goal to give them a 16-13 win at 6:54 into overtime. Green Bay had more total yards than the Redskins (427 to 373), who punted on seven of their first eight possessions. Washington had the edge in first downs (21 to 17) as the Packers had difficulty moving the ball in the second half. Green Bay’s defense sacked McNabb five times, to four sacks of Rodgers by the Redskins, while the Packers turned the ball over twice – the last time fatally - to one suffered by Washington. In addition, Green Bay was penalized 9 times at a cost of 63 yards (to four for 28 yards on the Redskins). Donovan McNabb completed 26 of 49 passes for 357 yards with a touchdown and an interception. Santana Moss caught 7 of those passes for 118 yards while Anthony Armstrong added 84 yards on three receptions that included the long TD. Chris Cooley also had 7 pass receptions, for 69 yards. The running game was mediocre for the Redskins, accumulating just 51 yards, and Ryan Torain led the way with 40 yards on 16 attempts. For the Packers, Aaron Rodgers was successful on 27 of 46 throws for 293 yards with a TD and one intercepted; he also rushed for 30 yards on four attempts. With the long gain in the first quarter, Brandon Jackson rushed for 115 yards on just 10 carries and also led the team with 5 pass receptions that gained an additional 25 yards. James Jones had 65 yards on four catches and Donald Driver was right behind with 58 yards on his four receptions. It was the second overtime win of the year for Washington, and the Redskins were now 3-2. However, after reaching 4-3 to match their win total of 2009, they lost seven of their last nine games to finish at the bottom of the NFC East with a disappointing 6-10 record. It proved to be an especially disappointing season for Donovan McNabb, who ultimately clashed with Coach Shanahan, lost the starting job, and left after one year. He passed for 3377 yards with 14 touchdowns but also 15 interceptions. The Packers moved in the opposite direction. Several players had to leave the game against the Redskins due to injuries, a chronic problem early on, and afterward it was revealed that Aaron Rodgers had suffered a concussion. But he and the team recovered and, following a sluggish start, Green Bay went 7-3 to close out the regular season, good for second place in the NFC North and a Wild Card slot in the postseason. They won four straight playoff games on the road, including the NFC Championship and the Super Bowl over the Pittsburgh Steelers. Aaron Rodgers performed ably, completing 65.7 percent of his passes for 3922 yards with 28 TDs against just 11 interceptions. His 101.2 passer rating led the NFC, as did his 8.3 yards per attempt.